In a region where even the water is world-famous, you better believe the food is to die for. As is the case in the French region from which Evian hails: the Auvergne-Rhône-Alpes. Here, food is a way of life. 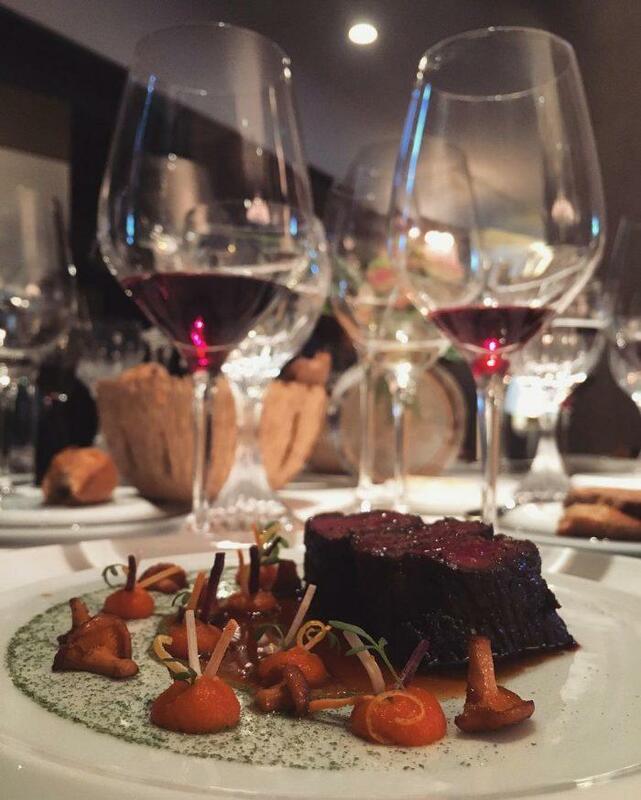 Dining in this region is a wonderfully rich and varied experience: from the bouchons of Lyon (the country’s ​‘gastronomic capital’) to the vineyards producing renowned Beaujolais and Côtes du Rhône wines, the natural resources of the region are a force to be reckoned with. Its warm sun, rich soil and the sweet waters of the Loire make their presence felt through the food this quaint region produces. Local gastronomic highlights include the cured meats of Lyon, fish caught in Lake Geneva, olives from Nyons and truffles from Tricastin. As for restaurants, the Auvergne-Rhône-Alpes has enough to suit every taste and budget, from cosy taverns to Michelin-starred cuisine. Maison Pic in Valence is a three Michelin-starred restaurant, a five-star hotel and an impressive family affair – it’s been run by three generations of the Pic family since being founded in 1899. Head chef Anne-Sophie Pic makes ​‘unapologetically feminine’ food in a male-dominated industry: complex sauces influenced by the world of fragrance, desserts that look like works of art, unusual tastes and textures that stir up memories. Her taste palettes are subtle and fine, classically influenced and yet creative. The ever-evolving menu has featured inventive and inspired dishes such as tea-smoked mackerel macarons, foie gras crême brulée with a green apple foam, and blue lobster with red berry dashi and chutney. The hotel is based in a pretty Mediterranean garden – a charming location in which to enjoy truly fine dining. If a picturesque backdrop to your meal is at the top of your wish list, then dining at l’Orangerie, located in the four-star Château de Candie, is an excellent option. A visit to this tranquil and luxurious château is like a taking a journey back in time. Just 15 minutes’ drive from the alpine resort of Chambéry, you’ll discover awe-inspiring views of the mountains from the château. The restaurant offers generous portions of mouth-watering cuisine in an elegant setting, with classics of French cooking made with local and seasonal produce. The sommelier can help you to match wine to your dinner – if you’re looking for a treat, the cellar stocks some excellent local Savoy. Dine in the elegant wood-panelled dining room indoors, or out on the terrace if the weather is kind. This beautiful spot overlooks the flawless château gardens – the perfect setting for nature lovers. 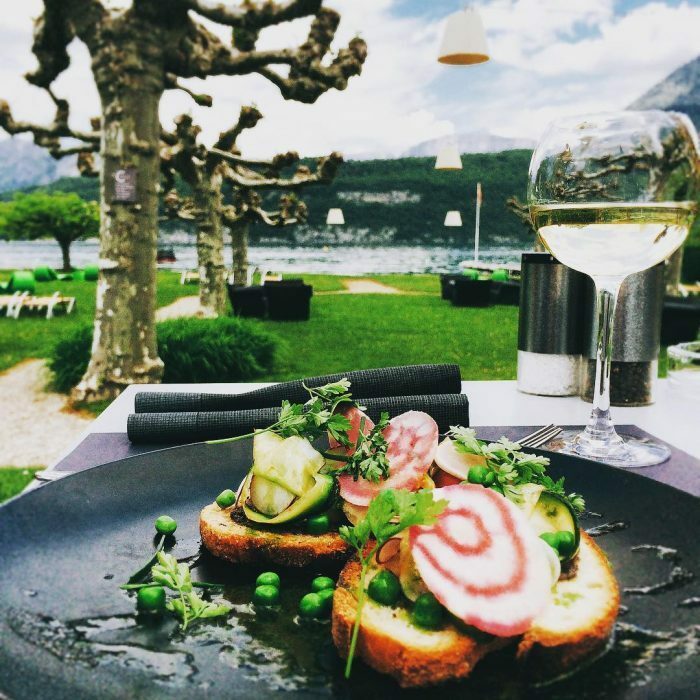 Equally scenic is the delightful Comptoir du Lac, with its sweeping views over Lake Annecy. After you’ve spent a few hours exploring the lake and its surroundings, this restaurant marks the best possible post-adventure spot for a bite to eat. Grab a seat at the edge of the water and enjoy the spectacular view. Comptoir du Lac is open and airy, with sun-drenched patios and a mountain backdrop. The interior seating area is fresh and minimalist, to match the lush greenery of its surroundings. The food is traditionally French, infused with originality and modernity. Classic Gallic flavours are reinvented for a menu that includes grilled mackerel with tarragon marmalade, skate wing terrine, and apple cider sorbet.